Home / Archive by category "hairdresser"
This pin adds sparkle to this up-do. Usually bobby pins are hidden in easy up-dos like this one. However, when you have easy dos like this one and great glam pins like this there is no reason to hide your pins. Flaunt them please! Some people like to replace the twist with a braid but this is less formal. This twist technique can also be used with curls or any other form of up-do or wearing your hair down. We here at Studio 229 Salon and Spa we love to do Holiday hair and would love to give you advice on what would look best on you based on your face shape. Give us a call at 206-322-6325. We would also love to do your holiday up-do for you. Feel free to visit our web site at studio229.net We are located in Seattle on Capitol Hill on the corner of Broadway and Thomas. Hope to hear from you! Solutions for curly hair can be found here or by seeing one of our specialist at the salon. A lot of people ask us if we have curly hair specialists. We do! Cutting curly hair can take a certain kind of finesse and intuition. We at Studio 229 are here for you. During your consultation we will ask you plenty of questions to ensure we give you the correct style for your curly mane. 🙂 For example: how do you style your hair? Will you be blow-drying? Would you like to wear it both curly and straight? Do you prefer volume or would you like to decrease bulk? A common mistake a lot of stylists make on curly hair is over-layering. Our stylist DeAnna likes to do a technique called twist cutting. This decreases bulk and accentuates the curl without creating bulky lines (AKA a shelf). She also great with curly hair and has plenty of techniques up her sleeve for de-bulking thick hair. Perhaps you don’t want to de-volumize. Big hair is in! We also know some techniques for building volume at the top or crown. A common problem with curly hair is the weight of the hair can make it flat at the top and the big at the bottom. This can create kind of a triangle shape. Not always what you may be going for. The trick is to find some balance and create a flattering shape. Soft tapered ends and volume at the top can help achieve this. 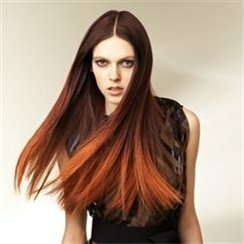 If you are looking to smooth the hair and reduce volume, am amino straightening treatment may be a good option for you. This is a safe way to remove some of the curl for a few months. The amount of curl removed depends on the hair type. Up to 100% curl and volume reduction may be achieved on less course hair types. If your hair is extremely course and curly the curl and volume will still be dramatically reduced. At this point you may wear your hair with a slight wave or with much less styling, straight. Either way this procedure dramatically reduces styling time! It’s amazing! Costs for this service vary on the amount of hair you have/ time and amount of product needed for your hair. You may come in for a free consultation to determine the cost and time you’d need to allot for the appointment. Have you been thinking about short hair?! Short says I am a confident women. I was inspired by the Golden Globes this weekend, watching all of the stars with their beautifully short hair. The look so elegant and feminine, youthful and fun! I hear a lot of women say that they could never have short hair because of this or that or face shape or feature. The truth is you just have to find the right haircut to bring out and frame your best features. I think every woman should try a short cut at least once in her life. It is empowering and can have the strength to advertise your confidence in a very comfortable and elegant way. Winter time is an introspective time and we can spend time on our look because it won’t melt in the sun and we are under so many layers, it is easy to let function take over fashion. Here are a few examples of different face shapes with short hair. And remember that short hair can and does not have to mean all gone! Short hair is a great way to exaggerate and open up the eyes. Keeping the length on top and having the sides tight allow you to change from bold to soft looks all with the same hair cut! A longer short style is a good place to start too! Bringing in a photograph of a style you like on a similar face shape to yours is a great way to open the dialog with your stylist about what look might work best on you. As a stylist who loves cutting feminine short hair cuts, I want to remind you that you should feel comfortable and trust your stylist. Consultations are vary important in insuring that you feel confident in your new do. Also complimentary maintenance hair cuts keep you short look feeling fresh. Please come and see us at Studio 229 on Capitol Hill in Seattle for an awesome short hair cut! Let’s look at the urban male haircut. The fastest growing market in the hair industry is mens’ hair. With men representing at least half of the population it comes as no surprise. Men want to look good and do not want to trust their GQ looks to a barber any longer. They are faithful clients who stylist can rely on to return in a timely manner. Gentlemen are even turning to color to perfect their fashionable looks and their trendy hair cuts. Men realize that when they look good they feel good. They know that they are more confident when they look good which can mean an edge on the competition or even a salary increase. Looking good and taking care of yourself is synonymous with success. Although this hair cut is a little long on top it is edgy. It has lots of texture and he is playing it up. It could be worn less dramatic. Lets look at some cuts that are men are wearing a little less dramatic. Although this image is not a favorite it shows a 2011-2012 trend in men’s hair cuts. That is the disconnection between the sides of the hair and the top. See how they do not blend. Because his jaw is so square it would look much better if the top of his hair was cut straight off in the back part leaving the front the same length and then add bold blond tips to his hair for a more dramatic look. He is sporting the retro sunglasses so he should put on a 50’s tie and jacket or at least a cool button down shirt to go with his look. It is about pulling off your whole look and not just part of it. Love it or hate it ombre hair color has been all the rage for the past few months. “Ombre” refers to a fabric dye dipping process where the fabric is dipped in dye, resulting in a graduated color effect. Usually from dark ranging to light or vice-versa. This effect can be done in hair color resulting in a natural, low maintenance and chic look. Another way to translate this look into a fresh, wearable look for the season is by using peek-a-boos. Peek-a-boos are a great way to add pops of hair color in a low maintenance way. The hair color is usually placed underneath, making the grow-out unnoticeable. Coppers are always great for spring! 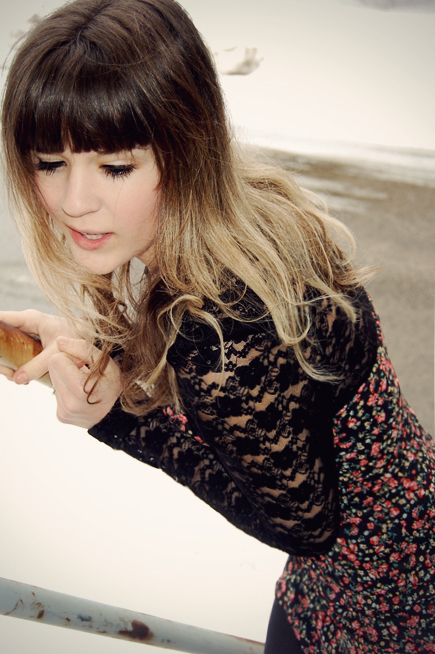 Blonde peek-a-boos are always a great go to update brunettes. This is such an easy way to add blonde without worrying about having to get touched up regularly. The above looks are soft and pretty, chic and hip. Below we can see ways to add pops of color with peek-a-boos underneath on the bang or fringe. This is an noncommittal way to change your look and spice up your hair color in a fresh and modern way. Whether you choose natural or pop colors peek aboos are where it’s at and won’t break the bank doing so! Come see us at Studio 229 hair design and spa to get updated for the season!